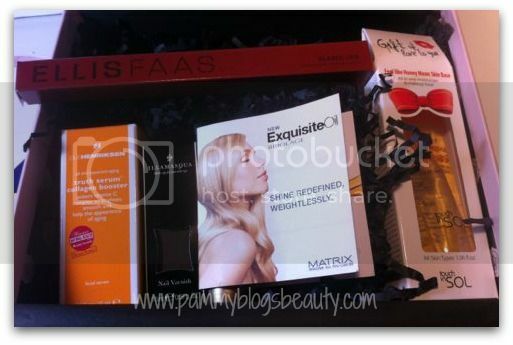 Pammy Blogs Beauty: GLOSSYBOX: Box Opening!!! It is time for another GLOSSYBOX box opening! Let me tell ya'll August 2012 brought the *best GLOSSYBOX* to date! I am so impressed!!! So, what is GLOSSYBOX? It is another "by-the-month" Beauty Box Subscription. Yes, there seem to be a ton of these lately; but, this is a good one!!! I am a huge fan of GLOSSYBOX! 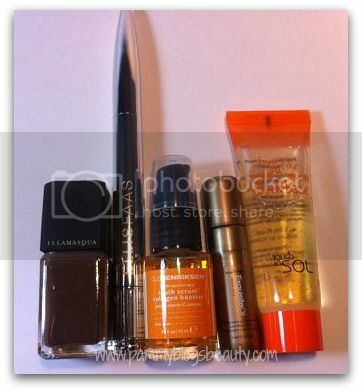 GLOSSYBOX is a luxury beauty sample subscription. For $21.00 per month, you get a beautifully presented and wrapped box of 5 deluxe beauty samples (Which includes one full-sized item!). This beauty sample subscription is more than double the price of Birchbox. So, I can't really directly compare them since GLOSSYBOX is pretty much double the cost. However, I do love them both! Birchbox continues to be my favorite beauty sample subscription in the $10 per month category. In the $20.00 beauty box category Julep Maven is great too if you love nail polish. GLOSSYBOX is certainly a favorite too! When you give GLOSSYBOX feedback on your GLOSSYBOX samples, you earn "Glossydots". 20 Glossydots are awarded for each feedback item. Currently, GLOSSYBOX members can invite friends to join through via email only. If you get your friend to sign up, you earn 200 glossy dots. There are no referral links available just yet. So, email is really your only way to earn points through people signing up. What do you do with these Glossydots? Well, when you collect 1,000 of them you can apply them towards getting a free Glossybox. That is pretty sweet. I just wish that they would accumulate quicker! Okay, enough background! Lets get to this month's box! 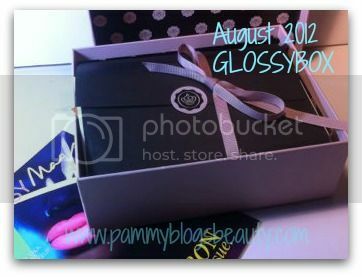 Please keep reading to find out what is inside the August 2012 GLOSSYBOX!!! With Summer coming to a close (sniff! sniff! I love Fall, but am always wistful to see Summer go...), GLOSSYBOX figures that we need some TLC. So, they packed this month's box with items to nourish our bodies from head-to-toe. Hey, I love to indulge. So, bring it on GLOSSYBOX!!! As usual, the box is beautiful! Nothing beats the box itself and the luxe presentation of the monthly GLOSSYBOX. The boxes are pretty and totally reusable. The wrapping is exquisite. There is no question that opening a GLOSSYBOX is like getting a present every month. I love this "treat to myself" from "myself", lol! The GLOSSYMag issue is "The Neon Issue". Biolage | Exquisite Oil Replenishing Treatment (Full sized cost: $22.00, sample size: .16 fl oz): Oh how my hair needs some TLC. I strayed from my usual color girl (shame on me! just trying to save some money...) and ended up with fried hair! I think that she left me processing under the drier for way too long, whaa!!! Anyways, my hair is extremely dry from the botched highlighting. This treatment oil is infused with "Moringa Oil" and apparently gives instant shine and replenishment. I need this! The sample is perfect for tossing in my purse for touch ups throughout the day. I am finding that my long hair gets really knotted during the day and I need to brush it out frequently (this is probably because my 8 month old cutie is always grabbing it). This oil will be helpful to apply before my brush outs. Ellis Faas | Ellis Lips (Full sized!!! Yay! Cost $35.00: As you can see, this one item alone is worth more than the $20.00 cost of the box. Whoo-hoo!!! ): I have never heard of this brand nor product before. So, I am super excited!!! Discovering new brands is one of the best things about GLOSSYBOX and similar monthly beauty subscriptions. Here I am about to try something totally new. Love it! These are lightweight and long lasting lip products. They come in a variety of finishes: matte, milky, and glazed/gloss. The packaging is incredibly sleek and modern. It is a long pointy metal/metallic tube. At first glance, it looks like a pen! The cap pulls off to reveal a brush type applicator. You just twist up the base and the product comes out of the brush. I got the shade L301. Illamasqua | Nail Varnish (Full Sized!!! Cost $14.00): Wow, GLOSSYBOX you are making me swoon this month! Another full sized product? Score!!! Are you guys keeping up with the mental tally here, the two full-sized products in this box alone retail for almost $50.00 combined. What a deal! Anyways, a big O-M-G here! I have *always* wanted to try something from Illamasqua. I have browsed this brand so many times at Sephora; but, I have never purchased. I am thrilled that they included this gloss! I got the shade "Taint" which is a gorgeous brown cream. Perfect for Fall!!! Can't wait to wear this!!! Cool packaging too. Very simple and chic. Ole Henriksen | Truth Serum (Full sized cost: $48.00 for 1 oz, sample size: .5 oz): Nice! I love getting serums in my monthly beauty boxes. Serums are so pricey and I seem to go through them quickly. So, I am always happy to get one in a sample box. Looking forward to trying this Vit C based serum. What a big sample! Touch In Sol | Feel Like Honey Moon Skin Base (Price of Full Sized $20.00 for 1.13 oz, this sample is almost Full sized, it is 1.06 fl oz): Wow, an *almost* full sized product here. What a generous GLOSSYBOX! I am so intrigued by this primer. It is a clear yellowish gel that actually looks a bit like honey! This goes on before your makeup to firm skin and allow for better application. I have never heard of this brand before. Exciting! That is it peeps! Wow, this is potentially the best GLOSSYBOX that I have gotten. 2 (and *almost* 3) full sized products. The value is amazing and the products represent a variety of beauty categories: hair, skin, makeup, and nails. Actually, GLOSSYBOX overall does create their boxes very well...lots of variety across categories. To me, this box is worth it for the Illamasqua polish alone. So many great items. I am super excited about the Vit C serum too! My fellow GLOSSYBOXERS, how did you like this month's box? I am a happy subscriber!